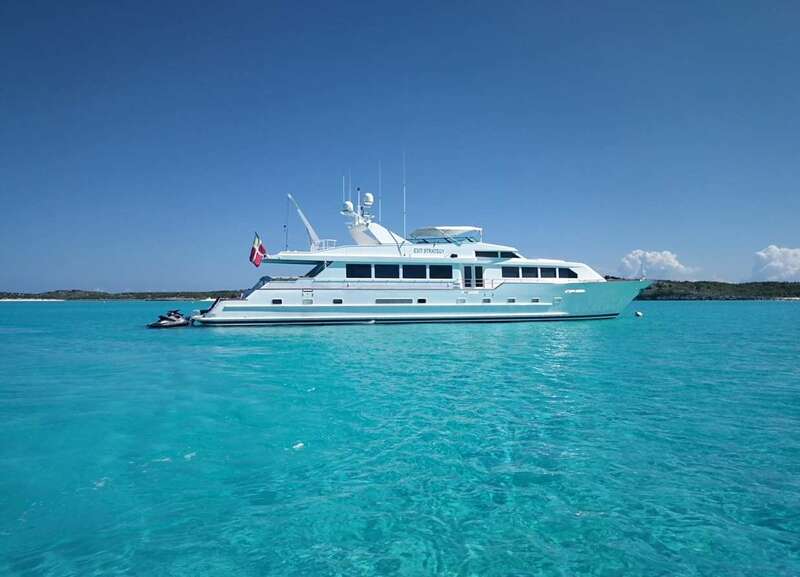 Motor yacht EXIT STRATEGY (ex Cedar Island) is a 33.50m (109' 11") yacht built by Broward Marine in 1995 and completely refitted in 2018, offering beautiful modern amenities and luxurious service on board. 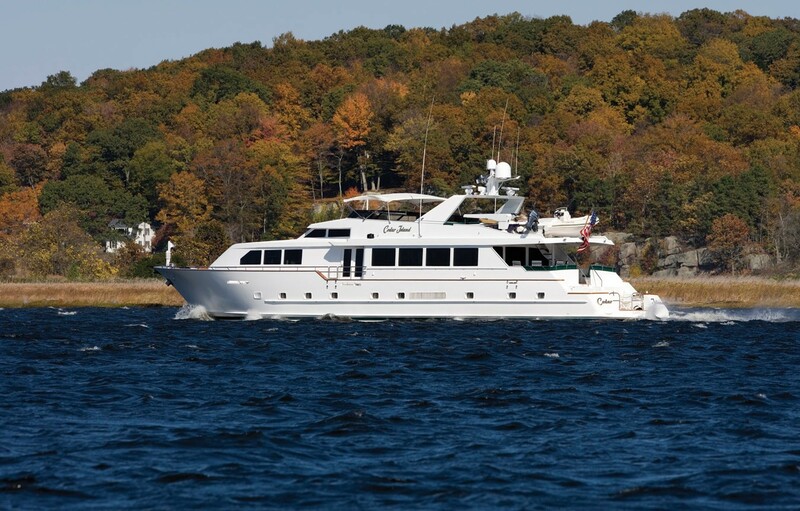 She is able to host up to eight charter guests in four deluxe cabins and has a crew of four. 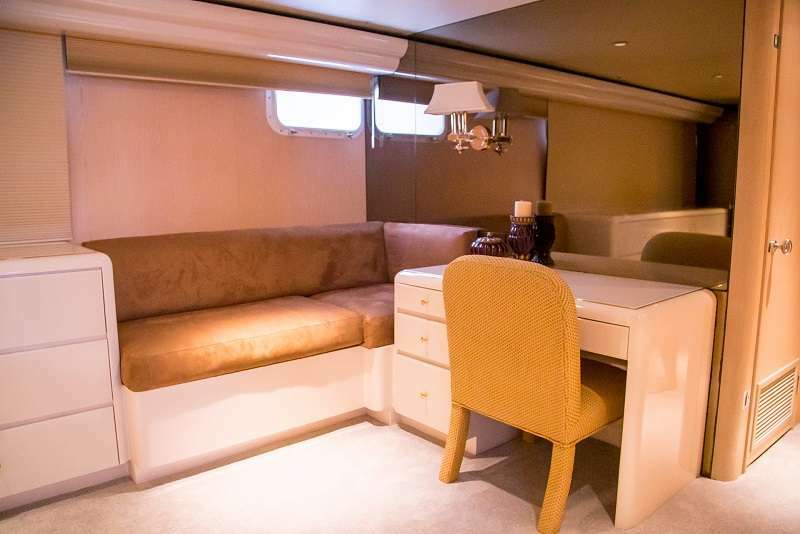 Yacht EXIT STRATEGY has a comfortable and light main salon with a large couch and coffee table aft and a bar area forward. 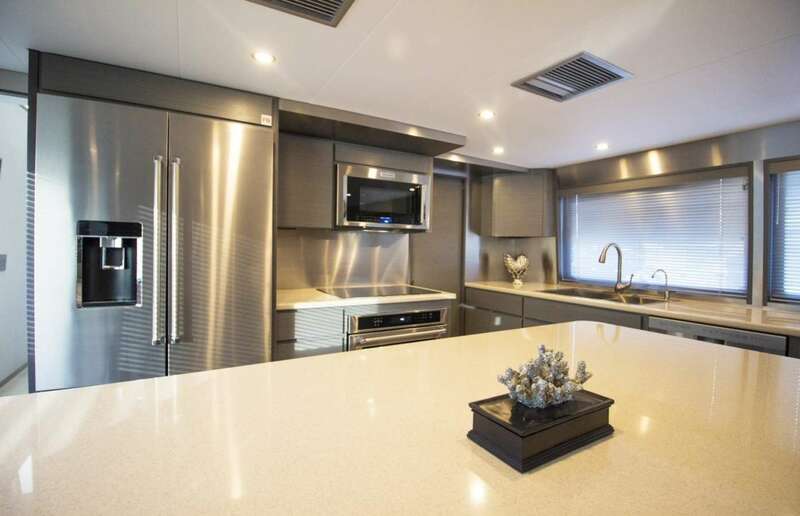 Further forward on the main deck is a country kitchen galley with a dinette. 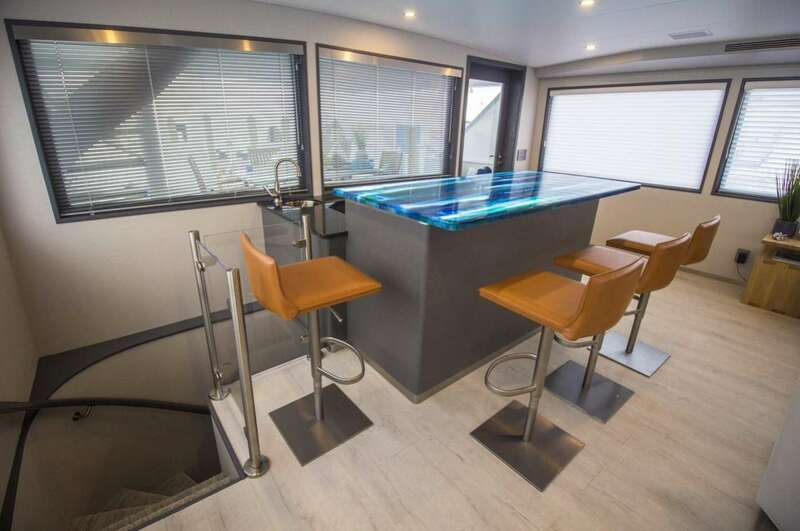 The accommodation area below is accessed via stairs at the aft of the salon and on the starboard side of the bar. 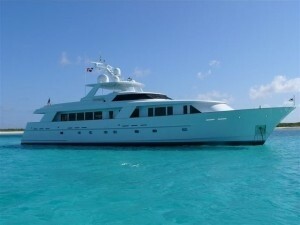 Motor yacht EXIT STRATEGY is able to accommodate a group of 8 in 4 cabins. 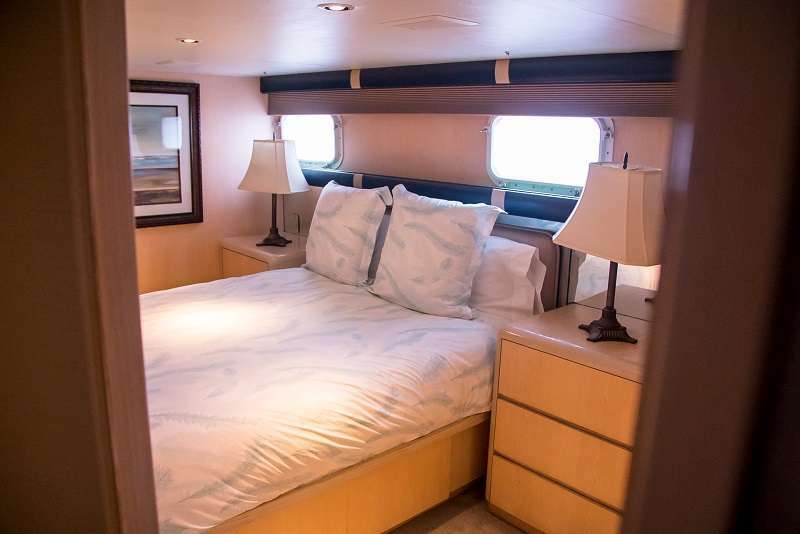 There is a well-appointed master stateroom featuring a king size bed, vanity area, and large walk-in closet, and a full entertainment centre. 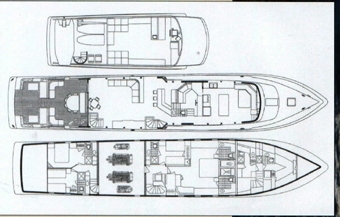 The remaining 3 guest cabins include a double cabin and two twin cabins (each twin has a Pullman bunk). 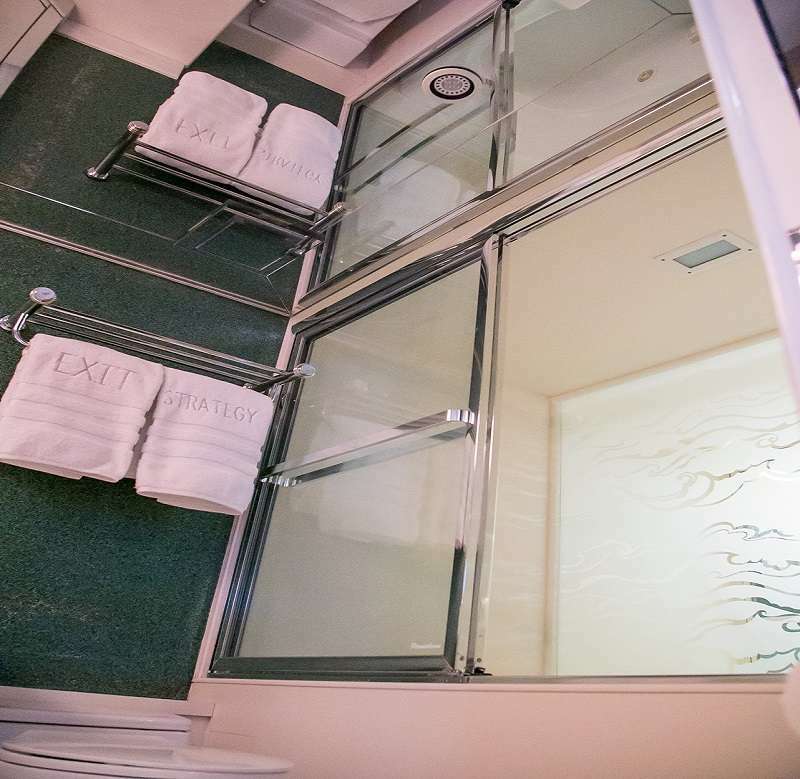 All cabins have their own private ensuite facilities. 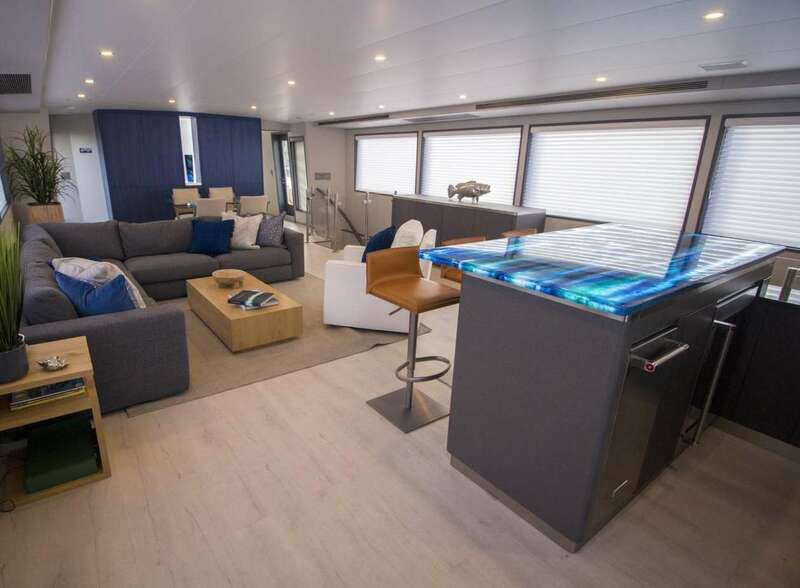 The exterior provides great areas to socialise or relax including her aft deck and where you can dine al fresco under the protection of the hard top or on the flybridge on the large new table that can accommodate all guests onboard. 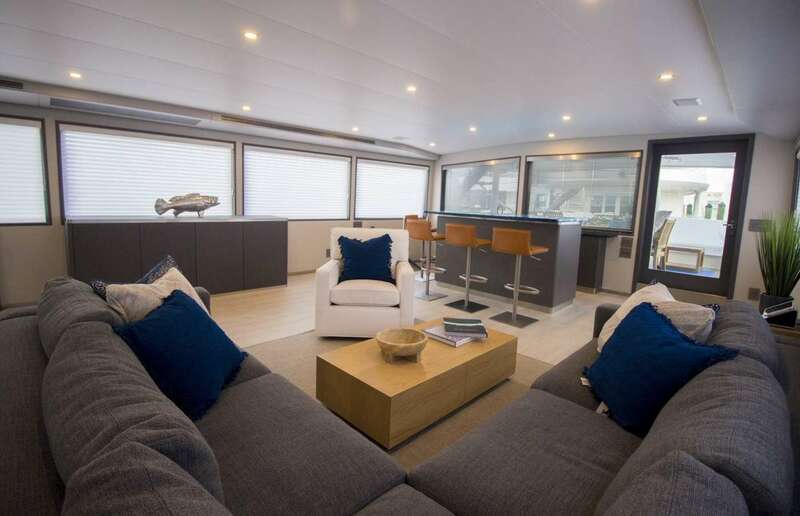 The flybridge also has several sun beds and couches for sunbathing during the day. 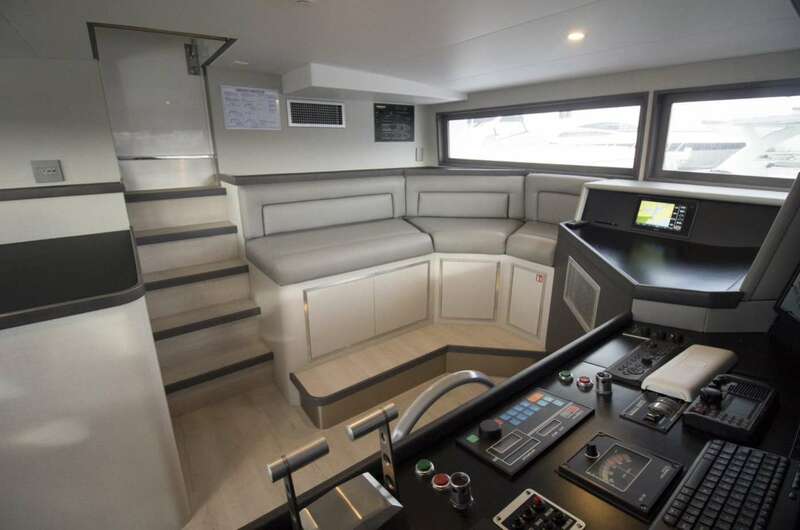 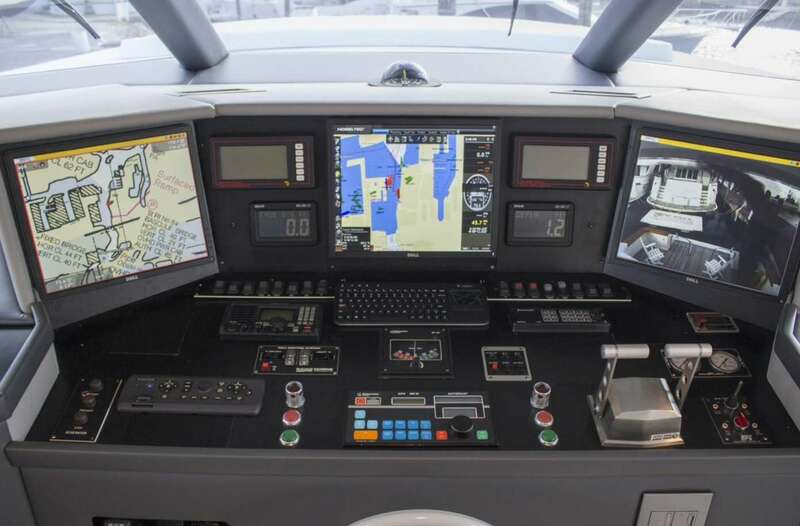 The cockpit offers an easy access to all of the water toys and swimming. 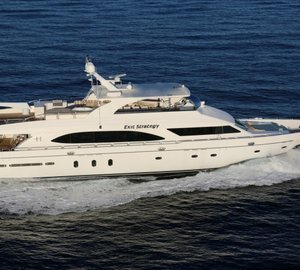 EXIT STRATEGY is able to accommodate up to eight charter guests in four cabins. 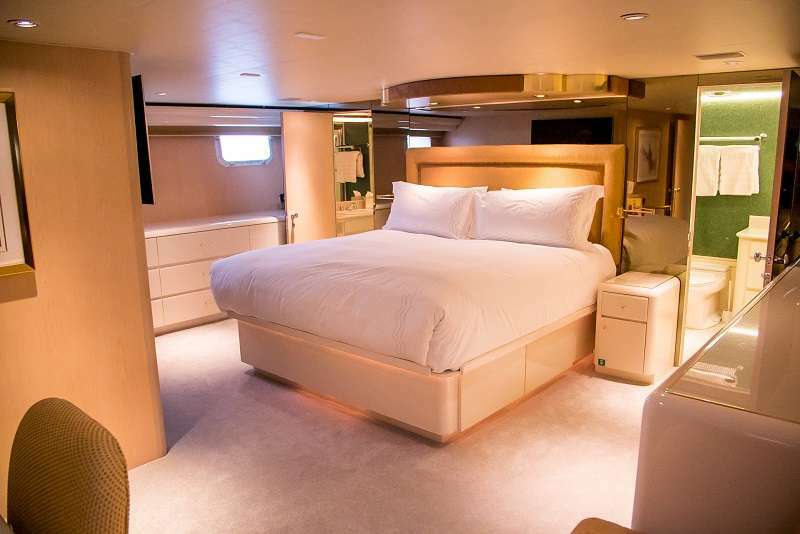 The master stateroom features a king berth and a separate his and her heads. 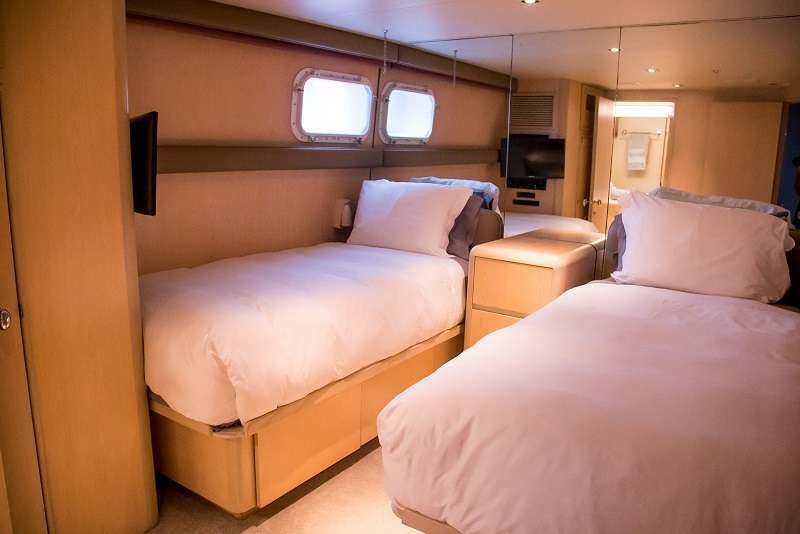 His head has a stall shower while the VIP Stateroom boasts a Queen Bed and an ensuite head with shower. 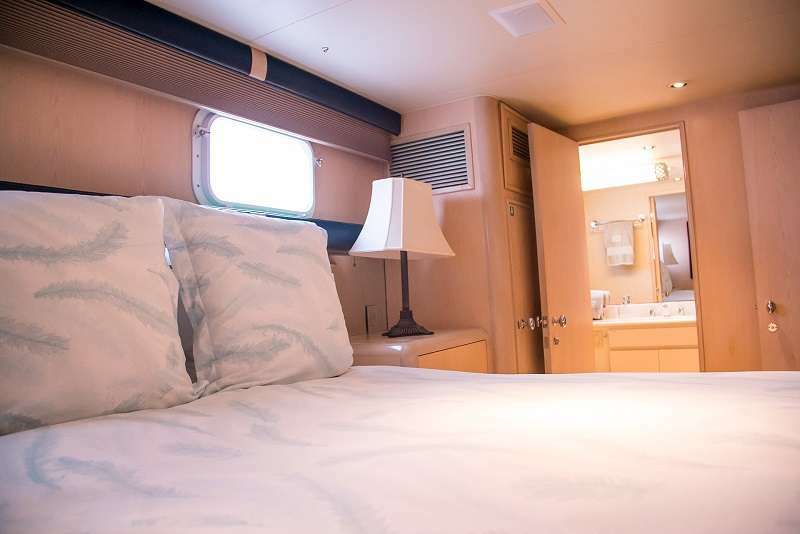 The port and starboard guest cabins each have twin beds with Pullman berths and an ensuite head with shower.